A blood flow, physiological motion, vascular and tissue simulation company for diagnostic imaging, radiation therapy and interventional applications for the following modalities; CT, MRI, PET, PIV and ultrasound. And ask about our "custom patient specific silicone vascular models". 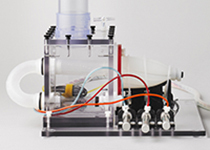 Shelley's programmable Multimodality DCE Perfusion Phantom simulates in vitro blood flow and two-compartment contrast flow pharmacokinetics using pressure-controlled fluid exchange with either step function-based or typical clinical arterial input function (AIF) inputs. 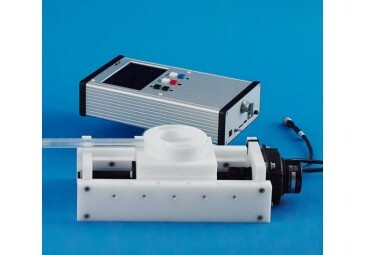 Flow range: 1.0 to 300 ml/s, accuracy of ± 3.0%. Realistic and reproducible volume flow waveforms. Programmable: SimuFlow III Waveform Editing Software. Applications: CT, OCT and ultrasound imaging. Includes an ‘MR Finger’ product to synchronize our pump with an MRI scanner for ecg gated studies. The MR-1A-XRV2 is a fully Magnetic Resonance Imaging (MRI) compatible linear motion stage for use inside the bore of an MRI scanner. The stage is made of precisely machined MRI-compatible materials and replicates, in real time, user defined dynamic and periodic motion profiles. The LV+ phantom has a unique design incorporating a contractile left ventricle (LV) with mitral and aortic valves that mimic realistic valve motion patterns. The phantom lets the user control a wide variety of parameters to simulate different heart rates, LV ejection fractions, contractile patterns and mitral valve pathologies. A programmable micro-controller controls the motion of six pneumatic actuation cylinders and a system of flow control valves. Custom MRI Compatible Or Multi-Modality Motion Stages Design And Manufacturing Service. Custom Designed Silicone and PVA Anatomic Model Service. Custom Silicone & PVA anatomical model design and fabrication Service. Copyright © 2018 simutec.com. All Right Reserved.